Evidence seized by Darien Police from a home in Darien, Conn. on Jan. 29, 2018 where Jack Read, 18, was allegedly manufacturing and selling drugs. 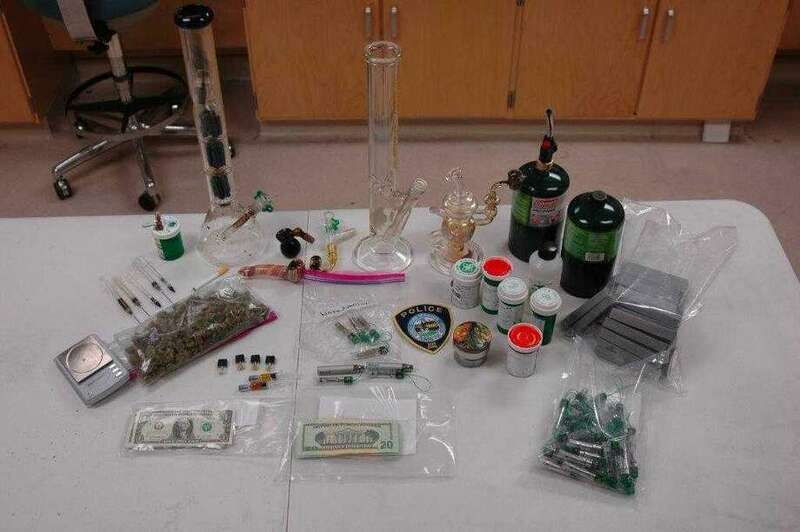 DARIEN — An 18-year-old Darien man has been charged with operating a drug factory after police said he allegedly made THC oil mixtures he sold to other teenagers. Police said they began investigating Jack Read, of Shady Acres Road, several months ago after learning Read was allegedly selling narcotics to teenagers in town on a regular basis. After compiling evidence, police received a search warrant for Read’s Shady Acres Road home. On Jan. 29, police acted on the warrant and searched Read’s home. There, they found evidence Read was selling marijuana, as well as making and selling THC oil mixtures, which can be used in vaping devices. THC is the active ingredient in marijuana. Read was also selling the vaporizers used for smoking. Police said Read also had LSD in his home, as well as $400 in counterfeit $20 bills. In total, police found about $6,500 in contraband at Read’s home. Read was charged with sale of controlled substances, operating a drug factory, two counts of possession of hallucinogens and two counts of first-degree forgery. He posted a $50,00 bond and was released with a Stamford court date of Feb. 9. “In an effort to keep parents informed, we are providing a picture of various types of vaporizing devices. These devices are intended to use vaporizing ‘juices’ or oils, but can be altered to ingest THC (active ingredient in marijuana) laced/flavored oils. These devices are difficult to identify as they often look like USB drives and/or computer components. It’s also difficult to detect their use as they don’t produce the smoke and odor associated with smoking of marijuana. The devices often give off the scent of the flavored oil when being used.